"Jersey Shore" Star Deena Cortese Is Barely Recognizable! Deena Nicole Cortese has had a pretty incredible transformation lately -- and today we barely recognized her with her noticeable weight loss and new veneers! The "Jersey Shore" star is the latest change her appearance after joining the show, following in the footsteps of both Nicole "Snooki" Polizzi and Jenni "Jwoww" Farley -- who both lost weight after Season One aired. Though she admits to Lumineers (and even chronicled the experience today on her Twitter) and a nose job in the past, Deena swears she hasn't had any recent plastic surgery. "I am not afraid to ADMIT i got plastic surgery so if I do," she tweeted yesterday. As for her new look, she says she "thinned my eyebrows..and lost weight thanks to the @freshdiet .. and learned how to do my makeup..lighter eye shadow brings out my eyes..and highlight under my eyes gives an effect of higher cheek bones.. the end. 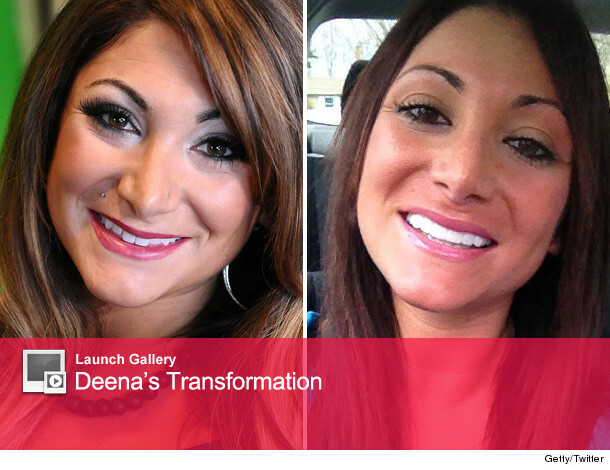 If I get the nose job I'll let ya know =]"
What do you think of Deena's new look? Check out her transformation since starting on "Jersey Shore" in the gallery above!